My name is Blue. Not because it was Mamma's favorite color, or because she loved the sea or the sky. There is a darker reason I'm called Blue. Uncle Bill told me that Mamma was confined to bed during pregnancy, confined to a bad marriage, and confined to an endless line of ghosts that haunted her from the hall. He told me she called me Blue, because it was how she felt. I never met Mamma. I can't guess at the secrets she kept, the reason ghosts chose to haunt her, or why people had a strange addiction to the deep blue of her eyes. When they talk about her, their mouths form great big smiles. They put their hand on my shoulder and tell me she was beautiful. And they use words like serene and calm. They tell me how much she loved the trees. Their descriptions confuse me. I've seen the pictures. In them, Mamma is always standing around other folks, but seems like she's alone or somehow out of reach. She never wore daisy crowns when she was young, or flowing summer dresses. There was no smile in her, no laughter filled her cheeks, and she held her hands in a strange way—with her palms rounded like cups, as if they were cups for water or dust—or for pain. When I squeeze my eyes real hard at the photograph of Mamma's wedding day, the one with her mouth wide open, I can see it—the sad something Mamma managed to hide from the world. The day was cold and Mamma has her coat on over her wedding dress. Her head is tilted in an odd way like someone else positioned it. And instead of the image of a happy bride, she's dripping with all the sadness she's gathered along the way. It flows out, that sadness, in her breath. And sits there forever frozen, a silvery smudge on the photograph. Nobody else sees it. Nobody but me and her friend Georgia Jean, who everyone says is cuckoo. She told me something about Mamma I'll never forget. She said, "Blue, your mamma was a vision. She was never really here, but she was a beacon of light for folks to steer by, in this misty place where so many are lost." Two years ago, when I was ten, I asked Uncle Bill about it. I'd said, "Uncle? Why does Mamma's breath have ghosts in it?" He'd just pulled on his cigar and shook his head like he had no idea what I was going on about. I didn't need to meet Mamma to know her life had been as black as the deepest part of fear, and as cold as a late winter's snow. Uncle Bill's dead now. I no longer have him to talk to, or at. My papa had gone away a long time ago, before Uncle Bill died. Uncle said it wasn't because of me. He said Papa was driven by some hungry need to leave the past, and everything that'd been in it, behind. I don't get it. How can you leave everything behind? How do you escape yourself? I live with my Great Aunt Millie now. She gets me clothes and keeps me fed. Potatoes. Lots of potatoes. But there is no one who I love, or who loves me. I walk to school alone under grey skies and long, lonesome rains and open birthday presents on the wrong month and day. I don't blame Aunt Millie. She's just really old. I spend most of my time with the towering trees that Mamma loved so much. And despite what outsiders might say, I do understand love. I have one love. One that is steady, pure, and true. 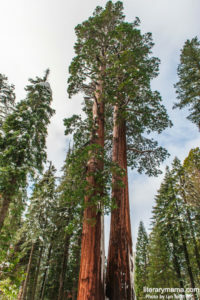 Folks call them redwoods and they reach into the sky and tower above like gifts from giants. They protect me from the dangers of the world, from the strangers that sometimes pass barefoot and hungry with eyes full of cold—and from my small but aching heart. The trees are strong and old—but not Great-Aunt-Millie-old. They're wise and know more than any human. I put my palms on their trunks and lean in real close. They whisper to me when the breeze is soft and low. Some of these giants have heads 300 feet above my own, yet somehow, they know I'm here. And if I hold my breath and concentrate real hard, I can feel their pulse and imagine Mamma is there waiting. Redwoods don't speak like aspens, cottonwoods, or alders—all hurried and unpredictable, the leaves falling over each other to get noticed. Redwoods speak from their core. The librarian told me it's called the heartwood. And that it sits inside the thickest part, close to the ground, where the giant is attached to the Earth. She said they're connected in an ancient agreement, unrecognized by most folks. And that the trees grow close together, in groups, supporting each other like family. And some days, I will admit, I'm jealous. Underneath all that dirt, their roots grow around each other like a really slow hug. There are some redwoods who have seen more than even Aunt Millie. Ones that have been through fire and have a hollowed-out center. Perhaps that's what Papa felt like. I heard he died a few months back. It doesn't seem fair. He's disappeared somewhere under ground. But the hollowed trees still stand, with their wounds in plain site. The branches far above are green, and the tops spend their days in the sky. They stand watch while Steller's Jays, woodpeckers, and the occasional eagle fly up overhead spiraling into the light. And at night the trees and I listen to the Great Horned Owls. When I hear them, it's as if they're calling me home . . . Oh! And the Dusky Footed Woodrats, a religiously solitary breed (I learned that from the librarian, too), sometimes pause for me to say hello, then scamper away under the fern leaves. Now, I don't want you to think I have no friends besides trees. I do. Friends who have big plans outside of this small town. Plans to leave as soon as their schooling is done. They tell me they will grow longer legs and run the distance it takes to forget this place. But I'll be happy if my legs stay short. I love this grey world that nearly every day wears a cloak of fog. It keeps us hidden from the rest of the world. And this town, my town, is protected by the ancient guards that will still stand, long after I, too, am dead and gone. Until then, I will never leave. A redwood doesn't fit in a pocket. I can't drag my old red wagon out here and cart away the forest's breath or the scent of the damp earth beneath my feet. No. I will stay here, under this canopy of trees that remembers times long ago. Before Mamma died. And maybe these trees will remember me, too, someday. I will stay here, where Mamma sometimes walked. They said she talked to herself and stood still a lot. Perhaps one day I will hear her voice come buzzing out from the heartwood or trickle from the sap. And if you'd ever like to meet me—not that I need anymore friends—but if you'd like to, you will know when you see me. I will be here on these green, mossy paths, and in the spaces in between, listening for memories and breathing long and deep with the glorious trees, until finally my heartbeat will slow enough to feel the soft ascent of Mamma's wings. Hollin Stafford was a flight attendant for United Airlines up until the time she had her son. She, her husband, and 13-year-old son are now happily living with their three dogs in Portugal. Hollin home-schools so they can explore the globe, and teach through experience. When not writing for the travel site Milesgeek, Hollin’s focus is on writing fiction. Her debut YA novel was just released. Hollin adores writing short stories and in 2017 she was listed on Glimmer Train’s honorable mention list and considered for the Fulton Prize from The Adirondack Review. She is originally from California.